Seat Undoubtedly Gained commendable eyeballs after the launch of its Cupra 280 but it looks like the car maker in no way has plans to sit back and relax. The statement comes from the Frankfurt Motor Show 2015 Where They shared Their all new Seat Leon Cupra 290 2016 .The model is Housed with lots of power and has Numerous safety and tech features loaded inside Hanes convenience of buyers. 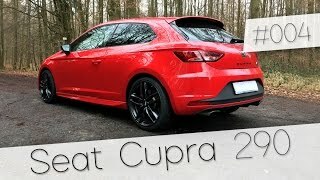 Let us have a detailed look at each of them through the review of Seat Leon Cupra 290 2016. The interior of the model Resembles a lot to its predecessors. Few standard features Which mark Their place back include Alcantara wrapped sports seats, steering wheel and the stitching to add the contrast. HOWEVER not everything is similar, there are some upgrades as well; The list includes a larger touchscreen Which now features infotainment and entertainment through its 6.5 inches display. The door panels get LEDs to add the serene essence of ambient lighting in cabin. The lighting as standard enlightens white and turns to red When the car is off. In all the details of the interior of the Seat Leon Cupra 290 2016 Can Be Concluded as, luxurious, spacious and comfortable. 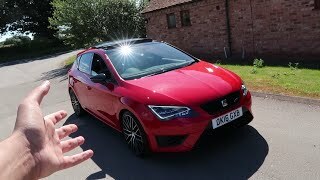 When it is about the exterior of Seat Leon Cupra 290 2016 I would prefer Beginning with the two integration did I personally did not like, is the first model badge at the rear and second is the new exhaust system. Apart From These Two for me rest everything goes fine. Starting with the front fascia the massive honeycomb grille sits amidst the LED headlamps. Moving towards the rear end you have muscular-look taillights and a rear diffuser flanked by the two Exhaust pipes. The Entire exterior of Seat Leon Cupra 290 2016 moves over the titanium finished 19 "wheels did give a tremendous look to the overall looks. 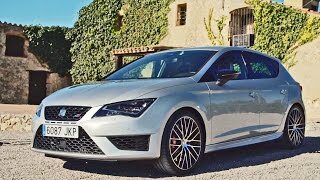 Beneath the hood of the Seat Leon Cupra 290 2016 is a 2.0-liter TSI engine cranking total output of 285 hp and peak torque of 350 nm paired to six-speed manual transmission as standard while the options for a DSG transmission to is available. 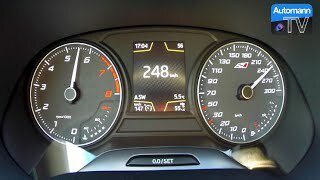 With this power rolling the 19 "wheels, top speed of Seat Leon Cupra 290 2016 touches the mark of 155 mph while the 060 mph sprint can be knocked in 5.8 seconds with the manual transmission while with DSG it takes 0.1 seconds less and settles at 5.7 seconds.